INDIANAPOLIS-- Kyle Busch won the Brickyard 400 on Sunday to make it clean sweep at Indianapolis. He led a race-record 149 of the 170 laps and beat Joe Gibbs Racing teammate Matt Kenseth to the finish line by 2.126 seconds. Jimmie Johnson was third, 2.638 seconds behind the defending Sprint Cup champ -- thanks to the double overtime forced by three late crashes. Busch became the first NASCAR driver to sweep the Xfinity Series and Cup poles and races on the same weekend. He also joined Johnson as the only Cup drivers with back-to-back wins on Indy's 2.5-mile oval. Johnson won in 2008 and 2009. Tony Stewart was 11th in his final Brickyard race after being assessed a late penalty for speeding on pit road. Five-time race winner Jeff Gordon finished 13th after coming out of retirement to replace the injured Dale Earnhardt Jr. Earnhardt is fighting concussion-like symptoms and has not yet been cleared by doctors to drive. 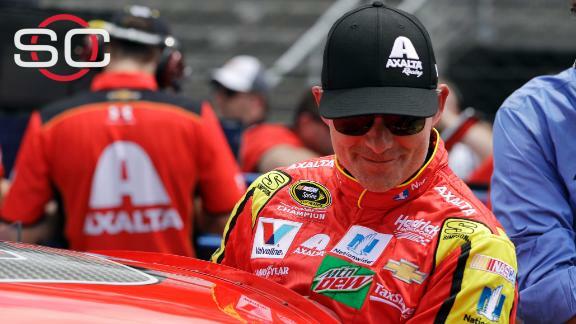 Ricky Craven assesses Jeff Gordon's 13th-place performance at Indianapolis Motor Speedway filling in for Dale Earnhardt Jr.